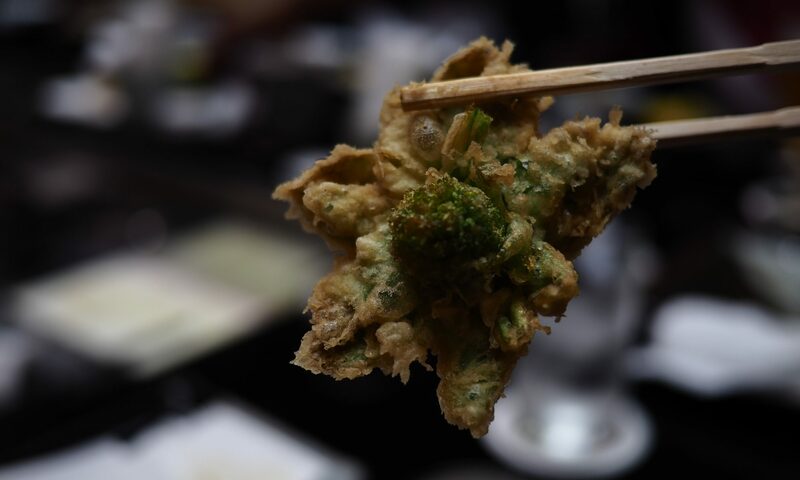 This Japanese way with fish requires you to think ahead by a couple of days. Once you’ve slathered it with its thick sauce, the salmon needs to cure and marinate in the fridge for at least 48 hours, by which time its flesh will be delicately infused with the flavours from the den miso. Once it’s out of the fridge, it’s simplicity itself to prepare under the grill. Marinading fish in den miso is a delicious, traditional treatment. Japanese grocers in the UK often offer fish ready-smeared and packed under plastic for you to cook when you return home. A den miso marinade is also used in Nobu’s utterly gorgeous black cod. I’ve never managed to find any black cod for sale, but salmon is just great here – try sea bass fillets too if you can get your hands on some. Most UK supermarkets seem to be stocking miso, sake and mirin (a sweet rice wine) these days, although the alcohols will be with the foreign foods section, not in the booze section. If your supermarket doesn’t carry miso, have a look in your local health food shop. I’ve noticed that for some reason, they almost all sell a good variety of Japanese kelps, soya sauces, and miso. Put the miso, sake, sugar and mirin in a bain marie and simmer the mixture (which is now den miso) over boiling water for 40 minutes, stirring occasionally, until the colour darkens. 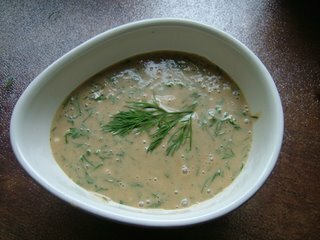 Remove the den miso from the heat and set aside to cool. Put the salmon in a small bowl and pour over the cooled marinade, making sure everything is well-coated. Cover with cling film and leave in the fridge for between two and three days, turning the fish daily. When you are ready to cook the salmon, lay it with the skin side down on a rack over tin foil. Grill under a high flame for about four minutes, until the miso is caramelising and bubbling as in the picture. Turn the fish so the skin side is uppermost and grill for another four minutes, watching carefully to make sure the fatty skin doesn’t catch and burn. The fish will be sweet and silky with a crisp and caramelised skin. Serve with rice and a green vegetable. Before we get onto the recipe, some family boasting is in order. Mr Weasel had his viva voce yesterday, and was let out after two hours fierce examining with no corrections to his thesis. This means that in June, he’ll become Dr Weasel at a ceremony for which I get to wear a hat. Well done, sweetheart! Evelyn Rose is an English cookery writer who specialises in Jewish family recipes and entertaining on a large scale. This recipe is from her The Entertaining Cookbook, published in 1980, which I seem to find myself drawn back to on every large family occasion. She has a calm and deft ability with cooking for large groups, and all the recipes I’ve tried have been foolproof. I use my mother’s copy, which she’s had for twenty years; most of its pages are falling apart now, and the cucumber salad page is splattered with two decades of the best sugary Swedish dressing in the world. Sadly, the book seems to be out of print now, although I have spotted second-hand copies online for around £40. Fortunately, I am frequently to be found in second-hand bookshops, so it’s likely I’ll find a cheaper copy some time before I get too old to read. Update: I finally found a copy of the book in late 2007, at the tender age of 31, for a mere quid on good old eBay. This dill mustard is far better than the stuff from a jar. 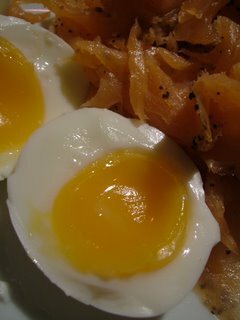 It’s my favourite accompaniment for smoked salmon; try it with salmon, some buttered rye bread and a small salad. Evelyn Rose says it keeps in the fridge for a month – here, it’s never hung around long for enough for me to test that assertion. The ingredients list may sound a little unorthodox, but I promise you it’s the nicest honey-mustard dill sauce you’ve tried. Just mix all the ingredients together in a small bowl until everything is well-blended, and chill for a few hours before serving so the flavours mingle. 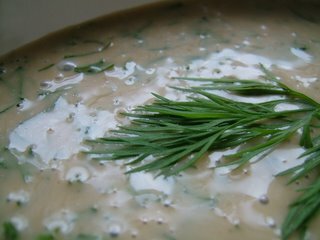 I prefer freshly ground black pepper in this recipe, and usually use far more dill – two of the regular-sized supermarket packs, or about five tablespoons when chopped finely. Kedgeree is one of those curious dishes to come out of colonial India, with European ingredients (in this case smoked fish, usually haddock) alongside Indian spices and rice. There’s an Indian dish called Khichri which is a close cousin of our kedgeree, made from rice, lentils, onions and spices. Here in the UK it’s a (now rather uncommon) breakfast dish. When I was a kid, our neighbours used to invite the whole street round for a New Year’s breakfast, in which kedgeree played a starring role. 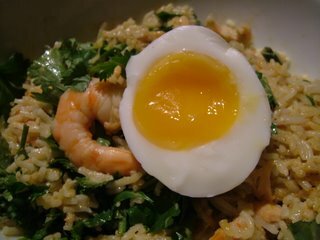 Kedgeree is a good idea if you’ve a lot of people staying in the house; you can prepare it the day before and microwave it for a very rich and delicious brunch. This kedgeree is a bit more delicate than the traditional smoked haddock version. 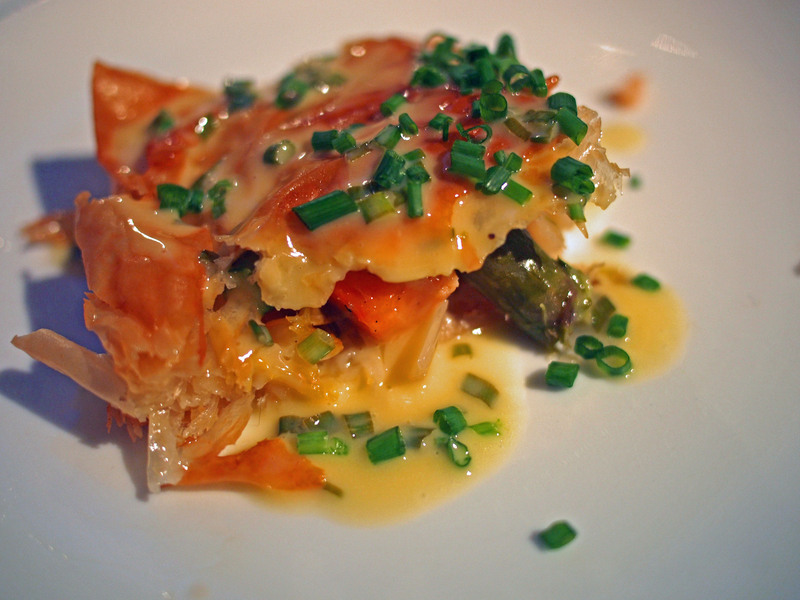 It uses barely cooked smoked salmon and fresh, sweet and juicy king prawns, and instead of strong onion, I’ve used spring onions. The salt used in curing the salmon is sufficient for the whole dish; you will not need to add any extra. It’s important that the rice is chilled before you cook; if it is warm or hot, the grains are prone to break up and become mushy in cooking. Carefully slide the eggs into boiling water and boil for six minutes; the yolk should still be soft, and the white just set. Peel, halve and set aside. Stir fry the ginger and spring onions in a wok until soft, then add the curry paste and prawns and stir fry until the prawns have turned pink. Add the rice to the wok and stir fry. After five minutes, add the stock and salmon, and continue stir frying until the salmon has turned opaque. Remove the wok from the heat and add the cream and coriander. Stir well, and serve with a segment of the soft, creamy egg. This dish is inextricably associated with New Year in my head, so I served it this evening with a glass of toasty, nutty champagne. Delicious.